If you'd like, you can read this newsletter online. Vegetarian dog treats, vegan dog treats, and vegetarian dog food are coming onto the scene as the next big thing. But, what do you need to consider when choosing vegetarian treats? Read our tips to consider when deciding if and what types of Vegetarian Dog Food, vegetarian dog treats, and vegan dog treats to give to your dog. Whether your dog gets a vegetarian dog food or not, he's sure to appreciate a vegetarian or vegan dog treat or two. Try our Vegetarian Dog Treat recipe, an easy dried beet chip that's sure to appeal to your dog's sweet tooth. Or, a sure fire favorite is a healthy alternative to rawhide. 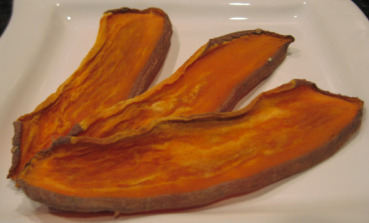 A Sweet Potato Dog Chew recipe. If your dog isn't much into chewing, then you'll both love these Sweet Potato Dog Treats recipe for muffins. But wait, those aren't for the two-legged family members, they're for the dog! We get lots of positive feedback from our website visitors, just like you. Here's what some of them are saying . . .
"This is a totally extensive, easy to use website." "Just what I was looking for and more! "First of all I would like to say that your website and ideas are the best I have found on the Internet - really inspiring! What's New for October? Pumpkins, Pumpkins, & more Pumpkins! 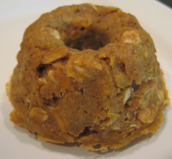 We're going to bring you our favorite pumpkin dog treat recipes. And, if you have a favorite dog treat recipe, share it with us and dog lovers around the world.